Some questions and answers about solar generators…. A solar generator is any device that converts sunlight into usable energy, either thermal energy, or more commonly, electric power. They can be any size, for instance; as large as the one in Spain that concentrates the sun’s energy into a bath of molten salt, that generates steam to drive a turbine/generator that powers a city, down to a small panel of a few watts to run a tiny fan. To narrow it down for our purposes here, a solar generator consists of photovoltaic (solar) panels, a battery bank, and an inverter. Quantum Harvest’s solar generators combine these components into an easily set up, portable machine that can be used anywhere, by anyone. It is designed to provide electrical power for running various items, the size of the item it will run will depend on the capacity of the solar generator. Generally, all but the smallest versions, the Models 175 and 800, will run full-sized refrigerators and freezers, as well as smaller items such as flat-screen TVs, computers and such. They will also provide power to charge batteries, cell phones, etc. It is not recommended to attempt to run large resistive loads, such as electric water heaters, electric kitchen ranges, central air conditioners, and other such items. These appliances draw large amounts of current for extended times, and will quickly drain any reasonably sized battery bank. Also, with the exception of the Models 3000, 6000 and 5000, our solar generators do NOT provide 240 volt output. Compare to even the largest commercially available solar generator, our Model 6000, which puts out 6000 watts, and you can see what I mean. Putting in any generator, of any type that will reliably power an entire house is guaranteed to be very expensive! A portable solar generator works by collecting sunlight and converting it into electrical current in a photovoltaic (solar) panel. This electric current flows to a charge controller, which sends the current to the batteries, monitoring their state-of-charge, and tapering off the amperage as the batteries come up to full charge. The batteries then store this power until it is needed. The inverter draws power from the batteries, and converts it from 12 volt DC into 115 volt AC (house current) to power whatever is needed. Quantum Harvest units also feature 12 volt DC outlets and USB charging ports to power various compatible devices even without the inverter switched on. In addition, Quantum Harvest machines feature a system that allows the owner to charge the batteries and run the inverter off their car’s electrical system! If the lights go out, due to a storm, earthquake, or any other reason, it’s a good idea to have something to power your cellphones, laptops, etc., as well as be able to provide some illumination. Being able to power a refrigerator, freezer, water pump and furnace would be really nice as well, particularly in cold regions. I’ve been shopping around, and am really confused by all the numbers that solar generator manufacturers list; what do they all mean? 1: The battery capacity, expressed in amp/hours. 2: The nominal wattage of the solar panels. 3: The inverter continuous load rating, also expressed in watts. In all of these, more is better, but as always, there is a trade-off; more capacity meaning more weight and expense. The battery’s, or battery bank’s, if there is more than one, capacity to store power is measured in ampere/hours, shortened to amp/hrs. An ampere is a measure of current flow, and amps multiplied by volts equals watts, which is a measure of the amount of work that the circuit is able to perform, similar to horsepower for a car engine. A 12 volt battery rated at 10 amp/hrs can theoretically sustain a current of 10 amperes for one hour, and therefore has 120 watt-hours of power available to use, in theory, and a 12 volt battery bank with a 200 amp/hr capacity has 2400 watt-hours of power available. This is an overly simplified explanation, but will suffice to give you a rough idea of how things work. But remember, batteries are made of lead, and are heavy! More capacity must always be accompanied by more weight! A good rule of thumb is that each 2 amp/hr increase in capacity corresponds to 1 lb. increase in weight. The goal of a designer is to match the battery capacity to the inverter output, and size the solar panel capacity such that it will charge the batteries in a reasonable length of time. I have a gas generator for power outages, why would I want a solar generator? How much gasoline do you have stored? How long has it been sitting around? A gas (or propane, or diesel) generator is a fine thing, since it puts out it’s full rated wattage as long as it’s fuel holds out, or until something burns out…(Small generators really aren’t designed to be operated for long periods under heavy loads.) Many people caught in Hurricane Sandy, and earlier, Katrina, had generators, but without a functioning fuel delivery system, they quickly ran out of fuel, and after 24 hours, they were no better off than the people who did not have a generator to begin with. I live in an apartment, so a generator of any sort is out of the question. Not so. Unless you live in a windowless cave, you can use a solar generator. Since it produces no exhaust, it is perfectly safe, even preferable, to use it inside. The solar panels can be set up in a window, or better, a balcony to capture sunlight. There is very little noise (only a tiny fan to cool the inverter), so it can sit unobtrusively in your apartment, powering all the stuff that is necessary for safety and comfort! A neighbor in the suburb where I live had his generator stolen during the outage caused by hurricane Sandy. This isn’t really a question, but it raises a very good point: security. Having a generator and fuel for it doesn’t do you a bit of good if someone steals it. Unprepared, desperate and/or dishonest people will do whatever it takes to resolve their crisis of the moment. The more desperate, the greater the lengths they will be willing to go. The clattering noise of even a quiet engine-driven generator can be heard for great distances when a power outage has silenced much of the background noise. A solar power unit, on the other hand, is silent and the main unit is inside your home. The solar panels are brought in at night, when the risk of theft is greatest. What are some of the advantages and disadvantages of solar generators vs. gasoline generators? Once purchased, refueling is free forever. No odors, fumes or exhaust of any kind. No flammable liquids to store. Much safer and more discreet in a bad disaster situation. Storage is not a problem, you don’t have to worry if it’s going to start when you need it. Extremely long lived. Good long term investment. Better ability to run hard-to-start inductive loads like refrigerators, freezers, etc. Initially costs more per watt than consumer level generators. Continuous power output for resistive loads like heaters is less than comparably sized gas generators. In cases of severe use, batteries may need to be replaced after 5 years. Initially less expensive per watt than a quality solar generator. Will maintain rated output indefinitely, so long as fuel holds out. Other than engine oil and spark plugs, there is nothing to replace. Must have fuel on hand. Must be run outside, due to poisonous exhaust gases. Storage of gasoline poses safety and logistics issues. Deteriorating fuel and cold may make generator difficult or impossible to start, especially in high stress situations, or for persons with disabilities. Generator noise likely to attract unwanted attention in a bad disaster situation. Service life of typical consumer-level generators is short, especially when run at high loads for long periods. Ability to run hard-to-start items is very limited. There is just not much reserve capacity. Can I add additional cable between the solar panels and generator? Due to voltage drop issues, it is not recommended to go with a cable run longer than 35 feet, unless stepping up to a prohibitively large (and expensive) conductor. It is much better from an efficiency and cost standpoint to use a longer extension cord from the inverter to the load. What is the general life span of the batteries? Battery life depends entirely on how they are used; the more they are cycled, and the more deeply they are cycled, the faster they wear. A Model 2505 that sits in a closet, plugged into an AC outlet to keep the batteries charged, and only used a few times a year during outages will have it’s batteries last almost indefinitely; my guess would be 15 years +, maybe much more. At the other end of the spectrum, any unit that has it’s batteries drained completely each night would probably not have it’s batteries last much more than a year or maybe two, tops. As a general rule of thumb in solar systems, the designer’s goal is to not see the batteries discharged more than 25% on a daily basis, and most systems routinely used under such a load would generally see a 10 year, more or less, battery service life. Can these units be charged via 12V wind generator (could one be directly plugged in via the outside jack for car charging) and would that require a separate charge controller? I am not an expert on wind turbines, and there are many different types on the market, so my reply must perforce be fairly general. Because many wind turbines require a constant load, the corresponding controller must have a way to shunt unused current to a reactive dump load, usually some sort of heater element. A solar charge controller, on the other hand, has no such provision, so my guess would be that it would generally not be prudent to hook a wind turbine to a controller designed for solar panels. There are exceptions, but it would be impossible for me to know which specific models of wind generators would work with a solar charge controller. Anything hooked into the battery bank for charging purposes MUST be regulated somehow, or the batteries will be damaged by over-charging. A car’s charging system is obviously regulated, so it is fine to hook a booster cable from a car battery into the solar generator, in fact, I include a cable with our generators for just that purpose. I see that the generator itself is protected from an EMP by a Faraday enclosure, but what about the solar panels themselves? Would they be damaged by an EMP? While no one can be 100% sure of exactly what would happen in the event of an EMP/CME event because of the almost infinite number of variables involved in such a complex scenario, we can apply what we do know of electro-magnetic phenomena to make some predictions. One of the items most a t risk in such an event is the power grid, which because of it’s immense span of wires acting as power-gathering antennae, coupled with the current it is already carrying, will accumulate such large amounts of energy that it will literally fry everything connected to it. Another thing which is particularly vulnerable to the E1 phase of an EMP is anything that contains delicate electronic components (think computer chips and related items.) The induced voltages may damage these components, particularly if they are connected to any sort of unshielded wiring, again because of the power-gathering antenna effect of long wires. The general consensus among RF experts is that solar panels, or more correctly, the silicon wafers which make up solar panels, are not particularly vulnerable to the effects of an EMP; both due to the robustness of the design, as well as the fact that solar arrays are specifically designed to drain induced voltages into the collectors. The part most vulnerable, especially if the panels are connected to longish (more than 30′ or so) wires, is the is the blocking diodes, due to the induced current in the connecting wires. Fortunately, these are easily replaced, and we include a full set of spares with every solar panel we sell of more than 100 watts. Battery capacity is usually measured in one of two ways: For cars and trucks, it is all about the cold cranking amps, which is an indication of how much current is available to crank the starter. Total battery capacity is less important because the high current must only be supplied for a few seconds, and then the battery will be recharged by the alternator when the engine starts. Batteries in this case are almost never deeply discharged (flattened), and in fact doing so actually damages the battery to such an extent that it may be ruined in as few as two or three such discharges. In the case of solar power systems of any size, the batteries may be required to be drawn down and recharged many hundreds of times, and this calls for a different type of battery, called a “deep-cycle” battery, (also sometimes inaccurately referred to as a “marine” battery). In this application, maximum amperage (current) available is less important than how much total energy the battery can store, and this is expressed in ampere/hours, or amp/hours, so a typical deep-cycle solar system battery may be in the range of 20 amp/hrs, for a very small one, all the way up to 2,200 amp/hrs for the really big industrial batteries. What this means is that, in theory, a 20 amp/hr battery will do just what it says; supply a current of 20 amperes for 1 hour. Simple, right? Well, actually not quite…welcome to the world of engineering, where nothing is ever quite what it seems. What the battery manufacturers state in fine print is that the amp/hr ratings are actually spread over a 10 hour period, hence a 20 amp/hr battery would sustain a current of 2 amperes for 10 hours. You see, batteries are plagued by a phenomenon known as internal resistance, and remember electrical engineering 101? Current (amperes) flowing through resistance yields heat. More current means more heat, more heat means more resistance, more resistance means more current must be drawn to maintain the load, and so forth in a self-destructive, escalating spiral. If one attempted to draw 20 amps of current continuously from a 20 amp/hr battery, it would be flat in much less than an hour, due to so much energy being lost as heat within the battery. It could even damage the battery! So, you see, it doesn't do much good to put a 5000 watt inverter on a 100 amp/hr battery, as it would only run about 15 minutes, assuming the internal battery components didn't melt. Even 2500 watts of continuous load placed on a 210 amp/hr bank would drain the batteries in less than an hour. The only sensible reason to install a large inverter is to be able to start inductive loads, which brings us to the next topic: Inductive vs. resistive loads. Electrical loads, for the purposes of this article, fall into 2 categories: Inductive loads; for example, motors, such as the compressors on refrigerators, and resistive loads, such as lights and heaters. An inductive load like a refrigerator requires a huge surge of current, maybe 2000 or even 3000 watts to start the motor, but needs this much power for a very short time, usually a second or less. Once started, it then uses only a hundred watts or so to run. On the other hand, a resistive load, like a 2000 watt electric heater, would draw 2000 watts continuously as long as it ran. An inverter is an electronic device that converts (usually low voltage) direct current (DC) to higher voltage alternating current (AC). The typical consumer-level inverter converts 12 volt DC current from a battery into 115-120 volt AC current at 60 Hz (cycles per second), the same as what you get from the wall sockets in your home. It isn't necessary for the purposes of this article to delve too deeply into the mechanics of AC vs. DC, however, I do wish to briefly discuss sine-wave vs. so called modified sine-wave technology. In the diagram below, you can see an oscilloscope display of a sine-wave laid over a modified sine- waveform. Ok, that's as clear as mud, right? What's the difference in practical applications? 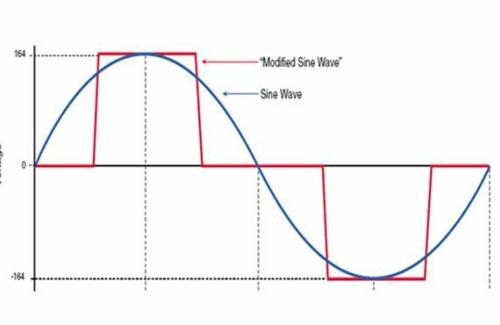 Simply put, a modified sine wave (MSW) inverter has much simpler control circuitry, so is therefore a lot more inexpensive to build, and is therefore priced accordingly. A true sine wave (TSW) inverter not only must have much more sophisticated control circuitry, but must also contain various components like chokes and filters to ensure a clean sine wave output, therefore a TSW inverter is quite a bit more expensive that a MSW inverter, and is also less efficient in it's conversion process, meaning more battery power is lost as heat. Ok, you say, then why does anyone need a true sine-wave inverter? The short answer is, generally, they don't. Non-geeks will say you “need” the “clean” power of a TSW inverter for your computers and cell phones. Rubbish! Computers, cell-phones, tablets, LCD TVs and 99.5% of all other electronic gadgets merely convert the AC power from a wall socket or TSW inverter back into good old fashioned low voltage DC current to operate! So, should one pay the substantial premium (roughly twice the cost) for a TSW inverter? That is something each person must decide for themselves, based on their own needs. One final thing that deserves mention when discussing inverters is the “surge watts” specification. To simplify, it all comes down to simple heat. An inverter rated at 2500 watts continuous power can, under most conditions, keep the components cool enough to operate under a 2500 watt load indefinitely. But because the components can actually handle a lot more power than that (until they melt! ), most inverters can briefly put out roughly twice as much as their continuous rating. The key word here is briefly! The duration (on the order of a tenth to a few hundredths of a second) that the inverter can sustain this output is so short as to be functionally useless. A moderately heavy inductive load like a freezer has to have a high starting surge for a second or two, not a fraction of a second! A good rule of thumb in the real world is that a good quality inverter will sustain about 50% more power than it's continuous rating for a meaningful amount of time (one or two seconds, at least), hence, an inverter rated for a continuous 2,500 watts will put out about 3,700 watts long enough to start a motor. Forget it's 5,000 watt “surge rating”; it's as meaningless as a politician's promise to balance the budget!